The ẸDÙN ARÁ – Bloco de Carnval project presents uplifting new percussion music and dance, mixing elements from Brazilian and Cuban rhythms. Grooves are funky, colourful & melodic and played on Surdos, Repiniques, Snares, Tamborims, Bells, Shakers & Timbas. They combine syncopated Surdo lines, 2 or 3 different Snare patterns played simultaneously with breaks & phrasing for Repiniques, Tamborms & Timbas. We work on a number of different pieces of music; each has a theme (or themes) reflecting the common roots found in Afrobrazilian and Afrocuban music. Dancers learn choreography which fits exactly with music presented by the drummers, combining traditional and contemporary movements. This project is open to all Samba and Community percussion groups and also to individuals who love to learn exciting original arrangements. 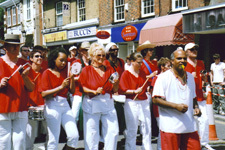 As well as learning rhythms, people work on dynamics and playing techniques to increase their awareness of interplay between the instruments. There were separate drumming and dance rehearsals with a couple of combined sessions over the weekend. Study sessions were structured to give participants plenty of free time to enjoy the wonderful ROTW festival. Drummers and dancers worked hard to parade the project on Sunday afternoon. Thank you to all the drummers and to Marcia and her dancers for making the music come alive. Congratulations to everybody who played and danced to Raz’s vibrants grooves! We definitely brought the contagious energy of the Brazilian Carnival to the Rhythms of the World festival: music, dance, colour, all together as ONE. Thank you to all the musicians, especially to the maestro Raz for the solid beats that moved us graciously forwards defying the heat. Thank you to my 7 OXUMS, for all the hard work and beautiful smiles, without you my choreography would be lifeless. Thank you Susanne, for all your support and great energy. You all made a dream come true! It could not have been better or more harmonious from the beginning to the end.